I might be using it. Aha, you can't really see the character well because she's at a side-view. The text also contains, "Ria: Je t'adore." SURPRISE! 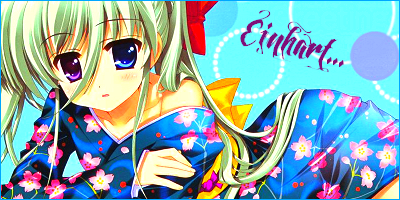 Matching avatars for this couple: Einhart and Vivio! Thank you so much for taking the time to make them. EDIT: Please remember to use the 70x70 png format for the avatars. Thanks for supporting again, Hory. For the highest quality, I did 70x70 PNG images. Is anyone taking signature requests at the moment? And also, I call BS. And I'll try to do one later I'll show you it if I find the result quite good, you want any picture in particular ? New avatar so yeah~I love Will of Abyss from Pandora Hearts. She is an insane person; she is unlikely of Alice. And really, my mood has been down so I feel messed up just as this person portrays my mood.